FindItMore | When it comes to selling a home, the bathroom is only considered the second most crucial room next to the kitchen. However, not all members of the household can cook yet everyone have to use the bathroom several times a day – which makes this space the most frequented room in any residential dwelling. The bathroom is usually a functional area which is why bathroom designs used to be focused on function more than style, but modern bathroom designs evolved to create distinctive and elegant styles fitting to the homeowner’s lifestyle which also turn it into a room where you can spend time in solitude and reflect on the day. It’s a great place to unwind, wash away stress, and maybe even get inspired. As time passes, your bathroom design might receive damage, feel outdated, not meet your needs, or you just want a new look. Renovations are the best way to introduce improvements which could benefit you and your family for years to come. Remodeling gives you the chance to repair all the damage in your bathroom, get rid of anything broken, and integrate the latest bathroom technology for convenient use. This is also your chance to turn your old bathroom into a more futuristic bathroom by adding smart technology. Your new bathroom could have new and cool features such as installing a jetted bathtub with water massages that you will not otherwise have if you did not do your bathroom remodeling project. It’s also an opportunity to increase the total space of the room. Typically, bathrooms don’t have a lot of allocated space can be added through remodeling. By adding cabinets, shelves, and wall storage, you’d be able to solve your issues in space. If you’re planning to sell your home, remodeling the bathroom will definitely increase the resale value of your home. 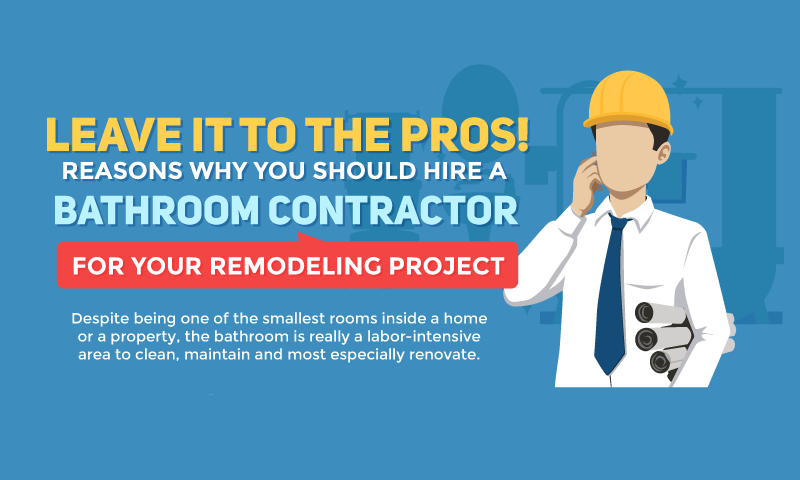 A lot of factors come into play for a homeowner when thinking about a bathroom remodeling: the time it takes to complete, the style, selections, and the biggest factor that most of them consider, the price. Several homeowners save money on remodeling by doing it themselves. It’s the best way to incorporate your wants and needs to the changes while matching your budget. If the project costs more than what you have on hand, you can do well to stage the remodeling in phases and match to your budget accordingly.You’ll have more control over the raw materials’ cost and the manual labor for the whole project. Doing the remodeling on your own also gives you creative freedom you can’t have when you hire someone to do the entire redesigning and remodeling for you. But sometimes, doing a remodeling project on your own might result in costly mistakes instead. Since most homeowners don’t have the proper skill set like plumbing or electrical work to do the job, they might end up spending more cash for repairs or worse, endanger themselves and their families. Paying extra cash on a contractor who has all the trades at their disposal is a worthier investment than spending it on poor materials and shoddy construction processes that will cost you more in the long run. This infographic by Luxury Commercial Bath lists out the reasons why remodeling should be left to the professionals. PREVIOUS POST Previous post: Lavender- A Beautiful Herb With Awesome Benefits!